Gotta get this stupid kite to fly! From "You’re a Good Man, Charlie Brown"
Today after church we headed up to F.E.N.C.E. for their annual kite festival. Whether we wound up flying kites or not, it was a lovely drive up to the Landrum area. I took four stunt kites and one single line kite, my entire collection. 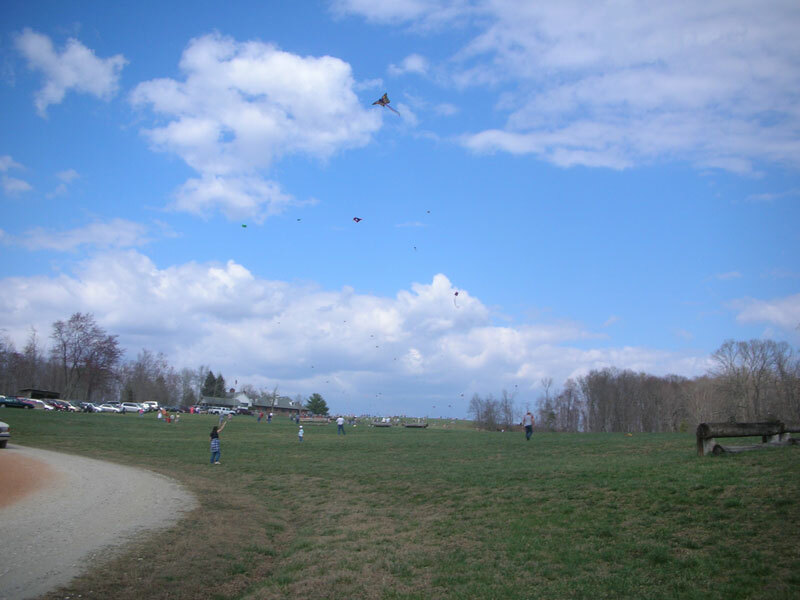 When we got there, the prime spot at the top of the hill was taken by tons of people with kites of all sizes and colors. There seemed to be enough wind near where we parked, so I unloaded my gear and we went in search of some open space. I first tried my best two-line stunt kite. There just wasn’t enough wind to keep it aloft at all. I finally resorted to a single line delta, and was able to keep it flying for quite awhile. Even though the wind was variable, I wanted to get at least one stunt kite working. I tried my smallest and lightest twin line. I was able to get it to fly for a bit, but when I tried any maneuvers, it came crashing down. After several frustrating attempts, we decided to pack it in. As we drove out, we noticed that the tree line was littered with colorful ripstop nylon. Even as we were enjoying our day of peaceful sunshine, the news was full of not-so-peaceful kite flying. Apparently in Pakistan there have been several deaths attributed to fighting kites with glass-embedded string. Officials there have banned the practice, and have arrested nearly 1400 kite flyers for using the dangerous strings. It gets its name from the practice of kite battles in Afghanistan using glass coated strings to cut the opponents’ kites free.